"Electricity lances every nerve of your chromed right eye and minute twinges shock your brow with a constant pulse, reassuring you that, despite the head wound, you're still functional. A collection of digitally enhanced shadows mark those chasing you, pulling the green threads of a targeting display into unsettling crystal clarity on the surface of you eye. Crouching, you pray, trying desperately to squeeze hope from your arifiiciual heart as your stainless steel hand clenches desperatly to your Walker .45. Answers are few and far between in this neon desolation, but, when you're ducking behind cover on a cluttered city street, there's little else to do anyway, so you might as well make the most of your time. Rain mixes with blood as you anxiously slide a new clip into your gun and take a deep breath. You're dead. You know you're dead. No one's even going to remember you. Funny how when you're dead, you never feel more alive. Welcome to the Burn." 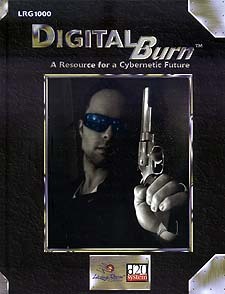 Widely recognized and critically acclaimed, the hard-hitting cyberpunk genre returns to the roleplaying world and introduces itself to the d20 community with the arrival of Digital Burn. Unlike any game before its time, Digital Burn seeks to merge the versatility of the d20 system with the gaming environment that revolutionized the way we look at the world outside our window.